When I was young I don’t remember crossing the Bay Bridge that often, but when we did it was always during a long car trip on the way out of town to somewhere like Tahoe or camping. I can’t say that there are a lot of memories tied to it, but crossing was always memorable and I was amazed by the steel work and the scale of a structure that was so big. It was one of those things that, as a kid, I saw as larger than life and indestructible. That is, until the earthquake in ’89 and I was completely incredulous as I stared at the news on TV. Seeing that disjointed section of roadway cocked down against the deck below made me feel as though I’d witnessed the slaying of Goliath. I love shooting the Golden Gate – it still captures that feeling of wonder in my soul when I visit it. For some reason, the Bay Bridge died a little in my heart that day and became like the not-so-interesting middle child that only served to give me passage to the other side of the bay. But, especially in the most recent years of the new Bay Bridge’s construction, seeing the growth of the new tower and watching them slide a whole section of the bridge to create the S-curve, some of the magic has returned. When I see the two structures side by side, I feel a nostalgic tug at the strings of my heart and can’t help but realize that I’ll miss the old erector set bridge. So, even though Laura and I had been in the car for several hours earlier that day returning from our Labor Day weekend getaway, I grabbed my gear and headed back out on the road once I heard that the new bridge was open (early, in fact) at 10pm. Once I exited the western span at Yerba Buena Island and came around the hill down towards Treasure Island, I was met with the site of the new bridge bathed in bright white light and I had to figure out where I wanted to shoot first. The magic was back and I’m so glad that I was able to shoot the image above while the old bridge still had its lights on, as though there was still a bit of life left in her as she passed the torch onto the new eastern span. I’m going to miss the old bridge as they dismantle it over the next couple of years, but the birth of this new structure is like a new beginning of inspiration. 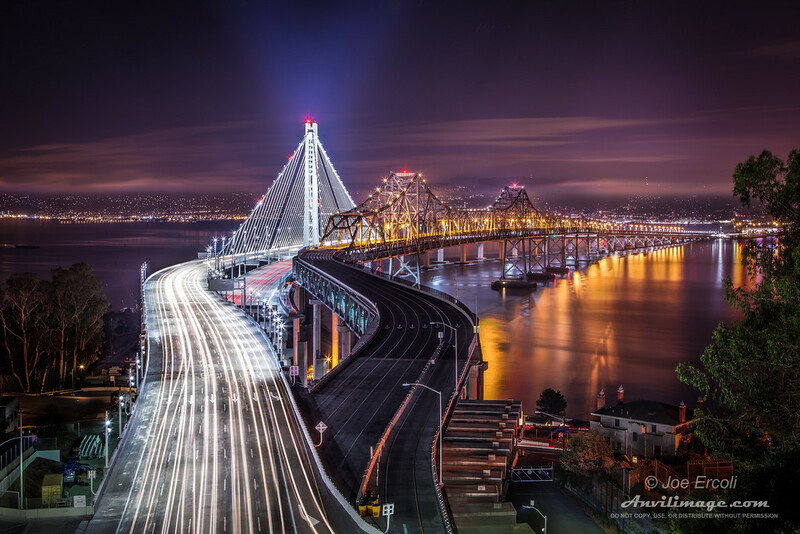 This entry was posted on Tuesday, September 10th, 2013 at 2:24 am	and is filed under Blog, Photos and tagged with 32 bit file, bay bridge, HDR, light trails, long exposure, new bay bridge, night photography, oakland, oakland bay bridge, San Francisco, san francisco bay bridge, sf bay area, treasure island, yerba buena island. You can follow any responses to this entry through the RSS 2.0 feed. Yerba Buena Island is a short hop halfway across the bridge to Oakland. If you’re carless, take a cab and ask to go to Yerba Buena Island, but they may not know it by that name because it’s known more for the now closed navy base, Treasure Island. The island is divided by the tunnel that connects the two sections of the Bay Bridge; so getting to the spot where this photo was taken can be a little tricky, but if you enjoy exploring, remember, it’s a tiny island and it’s difficult to get lost. You can take the off ramp to Treasure Island, but watch for signs on the right (before going down the hill to Treasure Island) to Yerba Buena Island. Hint: it seems like there is only one main island, but each half has different names. Confusing, I know, but fake it, just go and take your camera. In order to get this shot, you’ll have to park and get out of the car and c a r e f u l l y walk up the road until you see this view. It’s a little mezmerizing; so take your time and soak it all up before you head back.